The start of 2010 brings with it streamers, noisemakers, happy people singing, and a busload of freaking-cold weather. See that's what the snow wants you to think. It's sending out subliminal messages: "Play in me, I'm soft and fluffy. You'll love it. Don't mind the frozen extremities; they'll grow back." It's evil, I tell you. Pure evil! So, knowing this, you do what any sane person would do: You take the sled out with the kids and get completely iced over. At the same time, Jack Frost is waiting out there, stalking your noses like a polar bear does a herd of seals. In all seriousness, Hypothermia, Frostbite, and Other Cold Injuries: Prevention, Survival, Rescue, and Treatment by Gordon G. Giesbrecht, Ph.D. and James A. Wilkerson, M.D. (www.mountaineersbooks.org) is a very good book for this time of year, especially if you have children. My brother has seven kids, which includes two sets of twins. Can you ever imagine wrangling two 2 years and two infant babies at the same time? He and his wife have got their hands full. One afternoon their eight year old girl came home crying of her feet being so cold they were numb. So as any knowing parent would, my brother said, "Well, if your toes fall off, you'll remember that I told you to come straight home and not to play out in the snow." Let's talk about numb toes and red noses, or in other words, hypothermia: The cold's and water's evil love-child. Hypothermia occurs when the body's core temperature drops below 35 degrees Celsius or 95 degrees Fahrenheit. That's not a lot of leeway considering the normal human body temperature is around 37 degrees C (98.5 degrees F). You see our bodies are stubborn: they hate change. Any change and they decide to shut down. It's like some sort of mutiny. "You wanna drop my temp a couple of degrees, huh? Well, I'll show you!" It's like a living Union. The worst part about it is that we are bull-headed enough that during the first stage of hypothermia that we deny the fact that we even are cold. Then we get irritable if anyone dares suggest that we bundle up or put on gloves. Yes, it's true. One good dose of hypothermia and we become like the Exorcist. Our heads start spinning, and we smack-talk to anyone trying to help us. For instance, just the drop of 1 degree C in core temperature causes impaired judgment and slows our reaction time by half. If our temperature falls below 35 degrees C, then we lose the ability to make rational decisions. We become, well... like mean drunks. I can just see the TV ads now: "Friends don't let friends drive under the influence of hypothermia." Or the support groups: "My name is Joe and I am a hypothermic." Temperature drops below 32 degrees and our only innate heating system of shivering stops. At that point, we are two steps away from laying down and becoming a human icicle. 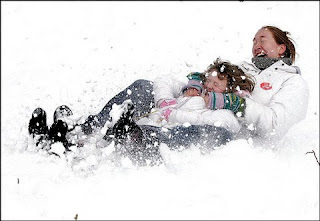 Here's a question for all the parents out there: Who tends to get hypothermia worse, you or your kidlets? Unfortunately, the kidlets do. Actually, babies, children, and elderly are most at risk. But for the purposes of this post, we'll focus on children, since the elderly are more likely to stay indoors during this time of year. They don't seem to find the joy in freezing their butts off. Go figure. 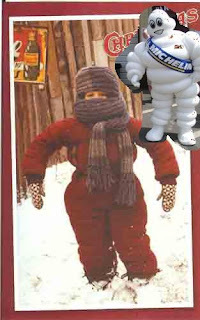 Anyone remember the little brother on "A Christmas story" being bundled up to look like the Michelin man? Now that mother was smart, she knew about this kid-care fact. Forget about her child's social life, she prevented his hypothermia. Okay, so maybe she went overboard. I mean really look at him, the boy looks like he can barely waddle. That's a sure ticket to getting your kid beat up. And then you'll have to deal with taking care of broken bones and bloody noses... but that is a totally different blog. Now, we don't have to go to that much of an extreme. But we can take into consideration that the manifestations of hypothermia in children don't present in the same manner as in adults. Due to this fact, hypo- and hyperthermia are very common ailments in children. All on their own, children are interesting little rug rats. Just like my brother's little girl, kids get so engrossed in playing that they tend to forget they even have bodies. Whereas an adult would say, "Heck with this, I'm cold. I'm going inside." A child would say, "What those are fingers turning into ice chunks? Who cares, just one more turn on the sled." In addition to that, children lose heat more quickly than adults do, mostly through their head. And you wondered if they stored anything up there at all. You know, I was studying the causes of hypothermia in children and one of the most common causes was alcohol ingestion. Now, I just want to know: Who goes about giving alcohol to kids? "Hey, Billy, I know you are five, but I think it's high time that you start drinking if you want to fit into with the rest of Mickey's club house." What the heck?! Granted, the ingestion of alcohol could be due to taking OTC cold medicines like Nyquil, but who in their right mind would send a kid with a head cold out and doped up on medicine into the snow? Anyway, I'll step off my soap box and get back to this post. *Children have smaller body masses, relative to their surface areas, leading to increased heat loss. *Children have limited glycogen stores to support increased heat production in response to cold. *Very young infants don't have the ability to increase body heat through shivering. Also, once children develop hypothermia, they are less likely to turn into mean drunks like adults do, despite having more severe hypothermia. -Use a weatherproof outer layer. In sub-freezing temperatures, use a breathable nylon fabrics with an insulating layer of fiberfill like Lamilite. -Avoid Cotton. Wool base layers are essential, and most importantly avoid wearing cotton under clothes. -Don't over layer. When playing or working, people sweat. I know, I know: it's hard to believe, but the little sweat fairies wave their magic wands over your pits and boom! Beautiful, glistening, saline comes oozing out of your pores. Now, what happens is that people get hot under too many layers while playing or working, so they sweat. Then, they unzip the layers and the sweat evaporates, cooling them down. They zip their layers back up. Yet, they still are damp underneath and thereby their core temperature drops even more, and pretty soon, they are hypothermics. -Instead, layer when not active. When you are working or playing, wear only enough layers so that you're a little cold. When you sit down to rest, add on more layers. When you get back up to play, remove the extra layers. -Items to Bring. Hat (extremely important). Gloves. Bandanna or hankerchief. Extra socks. -Stay Dry. Don't get wet inside your clothes or outside your clothes. -Eat high energy snacks. Snickers bars do come in handy. ;). Actually, eating things like granola and apples can help a lot. Next time, the clinical manifestations of hypothermia will be discussed and how to treat it. http://www.osteopathic.org/index.cfm?PageID=you_frostbite This link is for information on how to fight frostbite.